My youngest says his feet are really cold in the house and he would really like some slippers like mine. What can I say, I'm a sucker for kid's requests for hand knitted wearables. Saturday was a beautiful day to escape our hometown here in corn country. 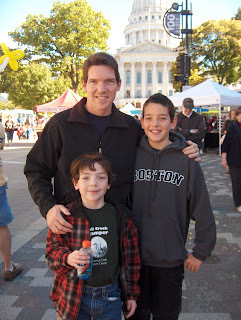 We made the trek 2 hours north to Madison to visit their farmer's market. It was wonderful! Tons of yummy homemade goodies. I even came across a farm selling organic homegrown/handspun yarn. Very cool. I kind of forgot that Madison is home to a Big Ten University and their football team was playing a home game. Dodging thousands of drunk college kids wasn't much fun but we moved to the other side of town so I could take my family to my favorite diner. My husband ordered a huge plate of meatloaf and mashed potatoes and I ordered a vegan rueban sandwich. It was a beautiful thing. Then I headed back home across the state line and my little Prius was surrounded by huge gas guzzling Hummers and Suburbans. We even witnessed a woman throwing trash out her car window onto the ground after exiting the Starbucks drive thru. Yep we must be back home. I've been knitting on my pirate hat. I cast on for the lining of this hat back in June. I picked Shine(sport) for this part. I'm just getting around to starting on the "pirate" portion in the last few days. For a while I thought it would be weird to do a pirate motif in Bears colors so I decided to pick a neutral fair isle pattern to use up my Bears colored Nature Spun. 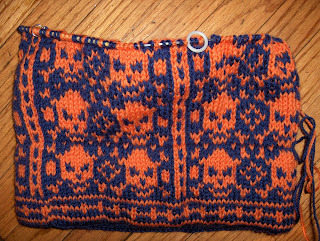 Well, I never got around to finding another motif I liked any better so We Call Them Pirates pattern was what this yarn was meant to be. 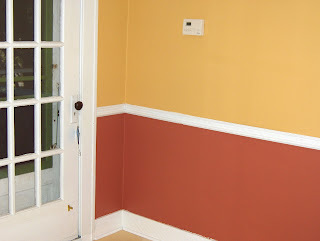 Yesterday we finished up only one of the two rooms I had planned to do. Home projects always take us double to triple the amount of time I think they will take. 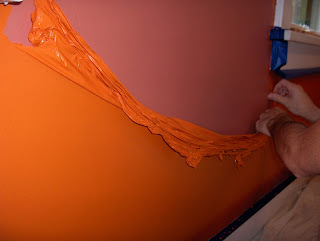 The worst part, it's exactly the same colors we've had in this room for 5 years. The best part, I don't plan on painting this room for at least another 5 years! I was able to watch a bunch of Tivo'd shows while waiting for the paint to dry. 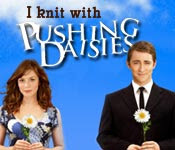 I'm really glad my husband had taped a new show,Pushing Daises. In the second episode one of the main characters, private investigator Emerson Cod, shares with us his love/obsession of knitting. Along with the "gun cozies" he knit up he also stores his money in hand knit socks in his desk drawer. He ended up narrowly escaping death by puncturing the body bag he was in with a knitting needle he was carrying with him. I know-how cool is that! 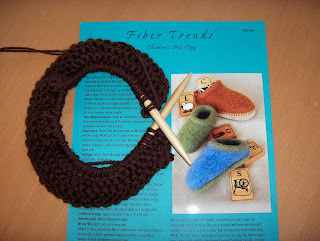 I'm currently working on 5 different knitting projects. That being said not a whole lot of knitting took place today. I knit a few rows on my Rogue this morning. I'm not so excited about how this one is knitting up. I'm surrounded by wool loving knitters and it's killing me not to chuck all the "friendly" yarns. 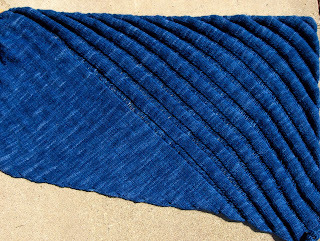 My malabrigo clapotis is just lovely if I block all images of the tortured merinos that produced this wonderful yarn. 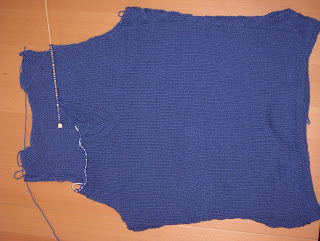 I'm so far into the rogue now though I'm not sure I can rip it to start over with another yarn. I realized last night we're already a week into SOCKTOBERFEST. What a great excuse to cast one on. I have a sasquatch foot. My huge feet require tons of yardage. I always use up most of the skein on the foot portion of the sock so I picked a sockette to try to finish before the 31st. Last nights Bears/Packers game was a perfect time to cast on and knit on this new project. 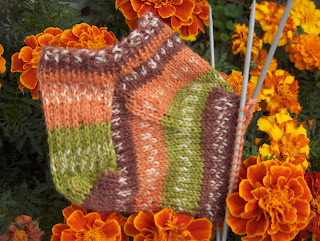 Speaking of socks, a huge thank you goes out to all my Etsy shop customers. I passed another huge milestone yesterday-200 Sold! It's been so much fun hearing what you're doing with your purchased bags whether they're for your own projects, for a swap, or for a raffle prize. Some of the best things I like about October are the brightly colored leaves, the apple orchards, and the cooler weather. It's 90 degrees outside today and our in ground pool is still open. I'm determined to participate in autumn activities so I drug the family out to enjoy the outdoors. We headed over to a nearby festival yesterday called Autumn on Parade. Yes it felt like July with the very hot temps but it was so nice to find some rolling hills in this huge state of cornfields and prairies. I had a great time perusing the art festival, the kids enjoyed the strolling entertainment, and my husband enjoyed the food. Good times! 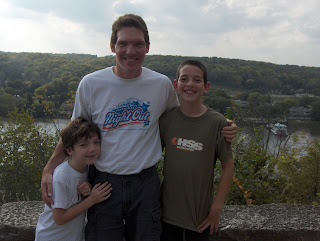 My eldest turned 11 yesterday and my parents came into town for a few days to celebrate with us. We were busy going here and there so I didn't make much progress on the knitting front this past week. I've made the biggest progress on my clapotis out of my three wip. I'm up to the decrease rows on my clapotis. 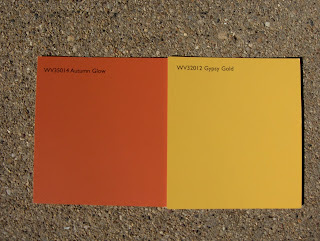 These colors may be my longing for beautiful fall weather which hasn't quite arrived here. I still have our pool open! That's how unseasonably warm it's been around here. 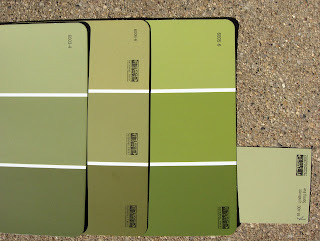 We're still deciding on the living room colors but at least we've narrowed it down to something in the "green" family.